long story short: I am an ice cream reviewer who has had a very rough day, though I need to remind myself it could have been worse. I would have loved to crash on the couch, but the cabinets were in need of restocking, so I headed to super walmart. I was just about done when what do I spy in the freezer section but a bright red box with NEW! written on it. I think I may have even cracked a smile ...well, at least on the inside. So, what do I see? NEW! 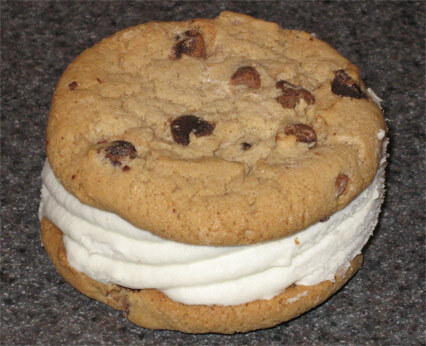 Breyers Ice Cream Cookie Sandwiches. 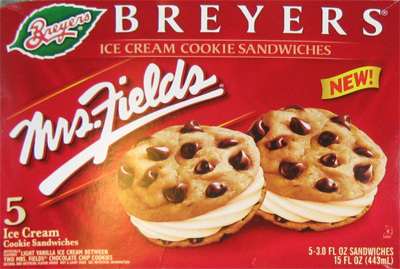 Two choices are presented to me: A blue box for Oreo sandwiches and a red box that uses two Mrs. Fields chocolate chip cookies to squish a slab of light vanilla ice cream. I grabbed the red box, finished with the freezer section and headed for check out. By now, you should know this box was opened the second the groceries were all in the car. The box was light, so I knew the treats were snack size, but I admit I still felt a little disappointed upon seeing the size of these 3 ounce treats. No matter, take off the clear wrapper and let the tasting begin! I like them. They aren't great, but they are good. The light ice cream is very basic (bland) and there just isn't enough of it. The cookies are respectable and you are left with a nice cookie aftertaste when all is said and done. Funny how the original used regular ice cream. The temptation to eat another is also pretty strong, but I think I can manage. On Second Scoop: Now that I knew what to expect (!cookies! ), this little treat hit the spot after dinner tonight. My only regret is not eating it slower!